When discussions become stuck in a ‘death-spiral’ of point-counterpoint views it’s useful to have some techniques to unblock the discussion. One great technique is to shift the focus from telling people about your views and start asking questions to understand theirs. I was in a bid planning meeting at a large consultancy when the discussion started to enter a conversational death spiral. Manager A believed that there should be a project manager involved in the project whilst Manager B disagreed. 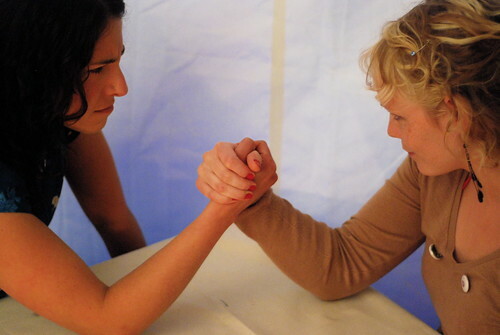 The conversation shifted from a discussion to a disagreement – the difference in views hooked the participants into a verbal arm wrestle over who was right. I realised that neither manager was asking any questions of the other. It was all “let me tell you again why I’m right”. It was as if each person thought the other person was just failing to see what was obvious to them, so each was using an ineffective strategy of repeating their view again this time stronger and louder. One well-placed question changed the nature of the discussion. The reduction in tension in the room was obvious. My question was designed to take the other person “down their ladder [of inference]” and produce more specific observable data. By doing so it uncovered some assumptions about what exactly was involved. Have you found switching from backing one side to asking questions about the other side’s ideas has helped unblock conversations? Share your views in the comments. The detail definitely helps uncover mistaken assumptions about someone’s position. 3. It explicitly highlights both common and different interests. I agree that a whiteboard or flipchart can have useful side effects. One that I’ve noticed recently is that simply by writing the topics being discussed, it can help people feel like their points have been heard and addressed. Not writing them up can lead to people continuing to “campaign” for them. By writing the topic down it allows it to be registered and put in the context of other topics discussed. I’m curious about the “tipping point” where the physical board stops being useful, so at the point where people stop taking turns, or where they forget to illustrate the difference between an interest and a position. Do you have any views or experience around this?